I recently "planted" two ollas in my vegetable garden. If you are wondering what an olla is, you may need to know that the pronunciation of the word is oy-ya. It is a Spanish word that means pot. Ollas are an ancient means of irrigation. An olla is a clay pot that is buried in the soil about halfway up the neck and filled with water. The water slowly leaches from the pot and irrigates the soil around the pot. They hold a couple of gallons of water and need to be refilled a couple of times a week. The ollas have covers to slow evaporation of water from the pot and, most importantly, keep mosquitoes out. Here is an olla in my squash bed. Each olla is supposed to water the soil 18 inches out from the center, so I planted four seeds around the perimeter of the olla. It was necessary to water the seeds as they began to grow because the roots of the seedling would not reach deep enough to hit the moist soil. I think the plants are now large enough to see if the water in the olla can sustain them without additional surface watering. This is a view of the squash bed from the other direction. The plants on this end are not as healthy due to pill bugs munching on the stems. The smaller plants allow you to see how the olla is buried and how the plants are oriented around it. Ollas are supposed to last several years. Any freezing and thawing during the cold winter months will probably be the hardest on them. As cold temperatures approach, I will stop refilling them and leave them the ground through the winter. 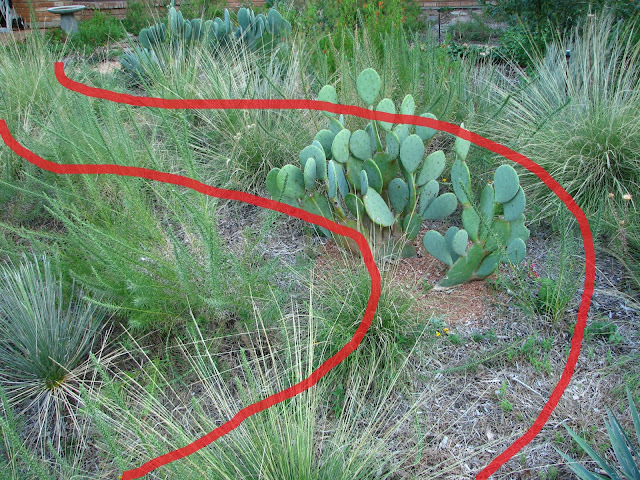 For your viewing pleasure, here is a clip from Central Texas Gardener about ollas. And here is another clip showing how to make your own olla. If you search the internet, you can find several plans for making your own ollas. Elsewhere in the vegetable garden, I have a patch of black eyed peas growing on my homemade cattle panel arch. The taller plant among the black eyed peas is my only surviving green bean plant. I planted green beans before I planted black eyed peas and the pill bugs mowed down all of the others within a couple of days. Fortunately, they do not seem to care for black eyed peas. I hope that one bean plant produces a lot of beans. There are a few more squash plants to the right of the beans. I am growing tatume squash on the other side of the cattle panel arch. I did not grow any squash in the spring because the squash bugs and squash vine borers were so bad last year. Maybe the pests have moved on and will not come looking for squash plants this fall? This is one of my surviving tomato plants. It is still green on top and starting to produce fruit. That is the ferny foliage of asparagus in the background. A few horn worms are chowing down on the leaves. They will eventually turn into hawk moths. Looking away from the vegetable garden, color is beginning to return to the garden. Clammy weed, eryngo, flame acanthus, scarlet sage, autumn sage, zexmenia, pitcher sage and bee brush are all in bloom in this picture. I should have more on the fall flowers in the next posts. One of the many gayfeather (Liatris) plants in my front garden is beginning to show some color. It will not be long before the plants are in full bloom. Their bloom should coincide with the peak monarch butterfly migration. It is about time the gayfeather earned their keep. When in bloom, the gayfeather plants are an asset to the appearance of the fall garden. They also provide a nectar source for a variety of pollinators, like bees and butterflies. But I think it is a bit of a liability during the summer months before it blooms. The green spikes sprawl everywhere and in every direction. These are more upright, but others grow more horizontally. This picture makes it all look a little better than it really does. I guess I kind of worry that someone will complain about the looks. Maybe memories of scenes like this one from the end of April help my neighbors get through the garden's rougher period from late July to early September. Next spring's flowers are getting started now. A rainy day last week coaxed some bluebonnet seeds to sprout. No complaints about the looks of this pine muhly. For several years, I have thought about adding a path through the largest part of the front garden. Besides giving easier access to the middle of the garden, it will break up the garden into segments that should be easier to design around. Of course, it will mean some plants will have to go. This is the view from the sidewalk. 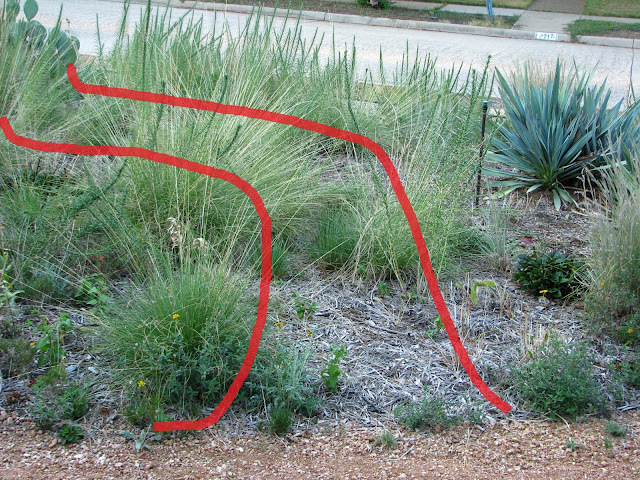 My thought is to curve up the slope and then curve around to join the pathway that runs lengthwise across the garden. This is the view from the opposite direction. Another thought for my pathway is to turn left and curve it back around to the decomposed granite pathway, instead of going to the sidewalk. I am also thinking of sectioning off an area for growing the gayfeather. Right now, the gayfeather is everywhere and it creates a wild and weedy look when not in bloom. If I do add a pathway, it will not be until after the fall blooming season.